I’ve been visiting with Poppy this last week. With the Royal Photographic Society distinction exams being held in a suite at the NEC, Birmingham, staying with my friend in Malvern, about 40 minutes drive away from the NEC, was not only hugely convenient but a great chance to catch up and to go out and take pictures together. Yesterday, we were in the Malvern hills for the sunset but we were a little early so we decided to go looking for a good spot for some other pictures. I suggested we go down onto the plain on the western side of the hills as the late afternoon sun would be casting a nice soft light. We drove down and at each junction I just followed my nose suggesting either a left or a right turn. Some part of me seemed to know where we were going Seeing a sign for Coddington, I felt that Coddington was where we should go. What a great name for a village. Passing a lane that had a sign saying ‘dead end’ and ‘Bush Farm’ we decided to take the right and drive down the lane. As we were approaching some farm buildings we saw an elderly man carrying a bucket. At his heel, following faithfully, was a collie sheep dog. Poppy stopped the car and I wound down the window asking if would be OK to take some pictures of the farm. ‘I don’t see why not’ the man replied so we drove a little further on and parked the car. We set up our tripods and started taking pictures. The man came back down the lane. ‘Let me show you something very special’ he said ‘follow me’. We followed onto the farm, through an arch and around the back of the rather lovely farm house. Here we were treated to a lovely view of the Malvern Hills. Feeling very privileged indeed, we started to taking pictures..
Back into the farmyard we noticed the faithful sheep dog’s kennel cleverly cut out of the wood pile. This photo opportunity was a real gift. As is the way with collies generally, she was a lovely dog and seemed quite happy to pose in her kennel.. Moral of the story, when you’re out taking pictures, if you need to get onto farmland or take pictures of farm buildings, it’s good to ask permission. You never know what this might bring in the way of bonuses. We were very lucky. ‘the late afternoon sun especially makes for some very nice photographs’. ‘It takes all sorts’ he said. This entry was posted on March 5, 2014 by Chillbrook. 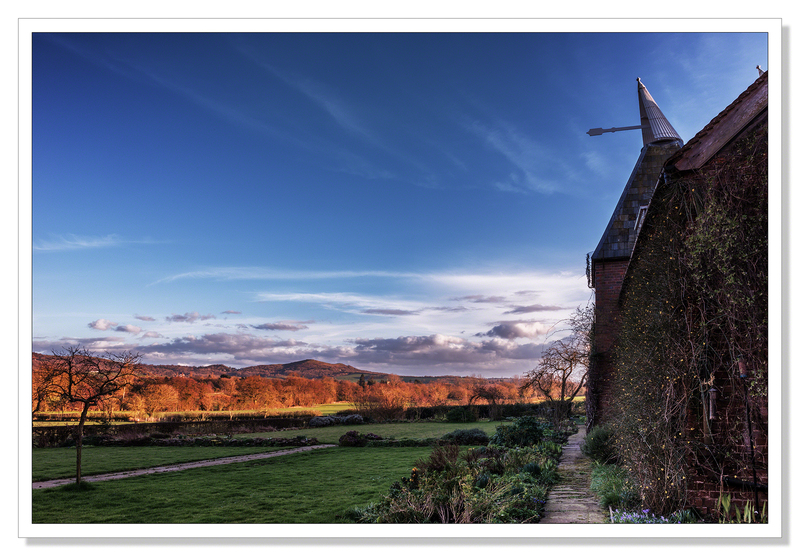 It was filed under Photography and Travel and was tagged with Adrian Theze, Bush Farm, Countryside, England, English Countryside, Landscape, Landscape Photography, Late Afternoon Light, Nikkor 24-70mm f2.8G ED, Nikon D800, The Malvern Hills, UK. Nice story, and an absolutely beautiful photo of the dog… And very cool for you to prepare a print for the farmer. It is the little things like this that impact people the most. Cheers! What a great time you had and terrific photos! Beautiful scene and love the pup! Thank you Sylvia! We were very lucky and the little dog was such a bonus! Yes, special light and a great story. Lovely! Amazing Photos. Asking permission is the best. I love this story. People are almost always kind and helpful if you only ask. Beautiful pictures and a lovely collie. I’m glad you’re sending a print. What a marvelous adventure and the trophy shots to take home with you. I bet the farmer will be impressed, too. Hope you include the pic of his faithful companion, too. Such beautiful photos, it kinda hit me as I scrolled down. Wherever the dog is seated, it’s beautiful! 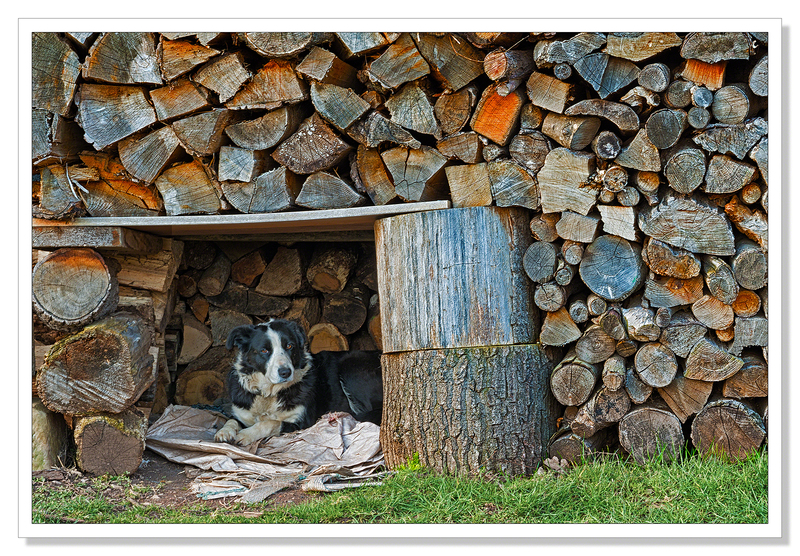 I’ll like to have a little rest place amongst the logs too! The collie in her kennel is so special, farmers ingenuity for you and a bonus on top of the light on the Malvern Hills. Thank you Norma, that’s very kind! Beautiful images… great depth in the first image makes it really interesting. Thank you Sreejith, very much appreciated! :-) Most of the time I’m using a 70-200 zoom and capturing candids. Hate it when the post but in the case of the farmer he sounded like quite a character and very proud of his land so he might have been a good and very cooperative subject ! I was teasing you based on your comment on my portraits post tho! :-) I think the farmer probably would have cooperated too of I’d asked. Maybe next time. If I send him some pictures, I’m sure we could visit again.. Your sixth sense led you to something special, Adrian. A beautiful image of the Malvern Hills, but that image of the faithful Collie is a real scene stealer. Nice processing too. Thank you Andy. I often just get in the car and drive around, following my nose and taking the road less traveled as it were. It usually leads to a picture. On this occasion it was pretty special! Great story, wonderful light! I love serendipitous moments like this…..